Each year Professional Pet Sitters Week is celebrated the first full week in March. The occasion serves to highlight the importance and benefits of in-home pet care as well as appreciate those professionals who take care of our feathered, furry, and scaled friends while their owners are away. This year Professional Pet Sitters Week will be celebrated March 2-8, 2014, and we here at Duck & Turtle Pet and Home Care have just joined the ranks of Pet Sitters International (PSI) to mark the occasion! Pet Sitters International is an elite group of pet-care professionals dedicated to excellence in pet sitting. As part of our PSI membership, we agree to abide by PSI’s Recommended Quality Standards for Excellence in Pet Sitting and PSI’s Member Code of Conduct and Ethics. 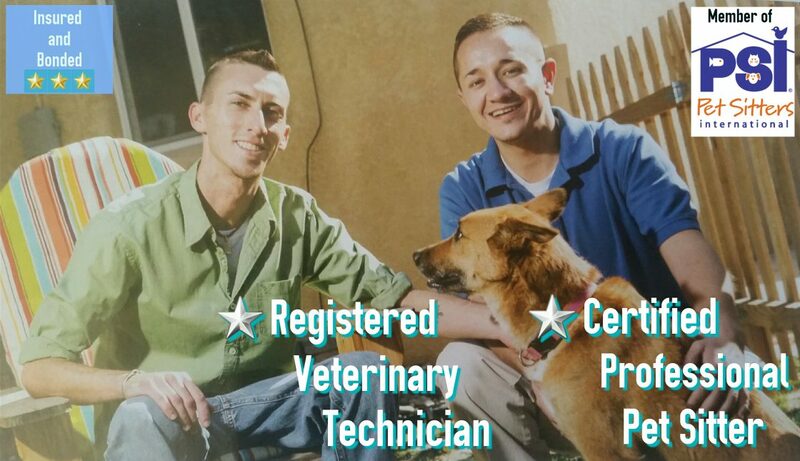 This is in addition to the oath co-owner Daniel Keularts takes every year as a Registered Veterinary Technician in the state of New Mexico. Also through their PSI membership, co-owner Jarrett Nicholson has begun in-depth educational coursework tailored exclusively for pet sitters with the goal of soon earning his Professional Pet Sitter Certification. The American Pet Products Association estimates that 2012 spending on U.S. pets will reach $52.87 billion, an estimated $4.11 billion of which will have gone toward pet services such as pet sitting and dog walking. With figures like these, we know that folks expect top-notch professionalism and care for their pets while they are away. This is precisely why Duck & Turtle Pet and Home Care has stepped up our business and professional development by joining Pet Sitters International. And it’s not just about the dogs and the cats anymore! A 2011-2012 National Pet Owners Survey revealed that there are 16.2 million birds, 16 million small exotics, 13 million reptiles, and 151 million freshwater fish owned in the U.S. With Keularts’s background in Veterinary Technology and the well-rounded pet care curriculum Nicholson is undergoing, both are thrilled to step up and be of service in these niches. As we celebrate Professional Pet Sitters Week, you may want to think of any trips or vacations you have coming up — spring break, graduations, weddings, family reunions, business trips — and contact Duck & Turtle Pet and Home Care early on to ensure your home and pets are left in the best possible care! You may reach us by phone at (505) 410-7954 or email us at info@duckandturtle.com!